As far back as 2007, Hollywood had eyes on adapting Jay Asher's book, 13 Reasons Why. The author turned down several production companies that wanted to bring his unique blend of teen drama and noir-ish mystery to screen, because, as he's said, "I didn't need to see my book turned into a movie to be satisfied." The person who changed Asher's mind? Selena Gomez. 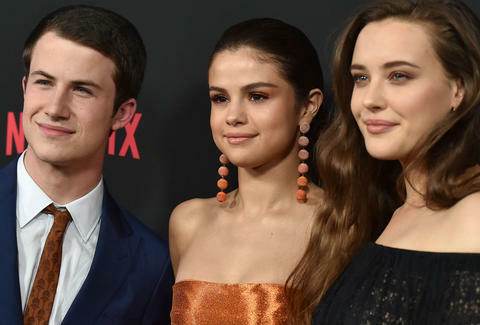 Since debuting on Netflix at the end of March, response to 13 Reasons Why has been through the roof, with fans reacting to the series' tragic drama, passing around Jeff Atkins memes, and wondering why Gomez, Disney-star-turned-pop-princess, was making press rounds and hanging around the cast. She's not in the show so... what gives? The answer is complicated -- but here's the story, presented as a timeline, of how Gomez got the TV version of 13 Reasons Why made. Asher published Thirteen Reasons Why near the end of 2007. In 2008, Gomez's mom, Mandy Teefey, bought a copy of the book from Barnes & Noble and shared it with her daughter. A few months later, in the summer of 2009, Teefey and Gomez contacted Asher in hopes of nabbing the rights to the book. After meeting over sushi, the deal was all but set. "It's always an eerie and extremely cool experience to talk to fans of Thirteen Reasons Why and realize that they understand everything I was trying to say," Asher blogged afterward. "Selena is one of those fans." Development of the movie would stall, but Gomez kept hope alive in 2013. "Books are so hard to translate into something that will do the book justice," she said in a 95.5 PLJ interview. "It is still happening, we'd just rather it be great than rush it." Thanks to some silhouetted promotional art posted on the book's official Facebook page, it looked like Gomez was still set to star in the movie as recently as 2014. "The older I got -- once I left [Wizards of Waverly Place], once I started to go for roles that weren't that age range -- it organically began to become a project that I knew I would be behind the scenes with," Gomez told The New York Times, regarding her job switch. "I actually like that I'm not in it. To be honest, this book has such a huge following. I wanted it to be credible. If I’m a part of it, that's going to cause a whole other conversation." "One of the reasons it didn't work as a feature was that there wasn't enough time to tell the stories of the other characters and why they were making the decisions they were making," Teefey told the Times, regarding the format change. "[Brian] was able to make them three-dimensional so that, at some point, you felt badly for them, too. That's why the feature [script] didn't work. Hannah just seemed mean." Because of a career sabbatical and music commitments, Gomez wasn't present for much of production. Series stars Dylan Minnette and Katherine Langford told E! that while Gomez and her mother found a way to get the adaptation to the screen, the singer, because of her busy schedule, "let the people who were physically making this make it," showing support along the way. Langford also told POPSUGAR that the singer connected with the cast near the end of shooting, saying, "She stayed with us the whole day on set and talked to everyone. She took us out to dinner and saw a movie with us, and we hung out with her. I don't think I can emphasize how generous she is and how genuinely she cares." Aside from exec producing, Gomez also recorded two songs for the 13 Reasons Why soundtrack: a cover of Yazoo's "Only You" and an acoustic cut of "Kill Em With Kindness." Almost immediately after 13 Reasons Why premiered on Netflix, speculation about a potential Season 2 began. When asked, in his Thrillist interview, if Jeff had a future on the show, actor Brandon Larracuente said, "If that time comes, I feel like Brian, myself, and a few other producers -- even Selena -- would sit down and discuss how much more we would want to build with the character." What does Gomez think of a Season 2? "We don't know what is going to go beyond [Season 1], but we know there are so many stories that lie beneath each character," she told THR. "So we'll see."